Ferrarini's passion for natural produce has led to the creation of outstanding balsamic vinegar: the Traditional Balsamic Vinegar of Reggio Emilia PDO. Its rounded and harmonious flavour adds a dash of sophistication to even the simplest recipes. We only use must from our own vineyards in our vinegar cellars, a place where artisanal knowledge and nature meet to create these extraordinary delicacies from Emilia. The Ferrarini Estate vineyards are located in a particularly favourable and fertile area. They extend for more than 35 hectares among the hills of Emilia, within a DOC region - the Scandiano and Canossa hills. The vineyards are positioned in the very best terroir, in terrain created by the decomposition of gypsum 350 metres above sea level. The art of waiting is the secret to our Traditional Reggio Emilia Balsamic Vinegar PDO: a patient ageing process that follows the passing of the seasons, using a traditional method. 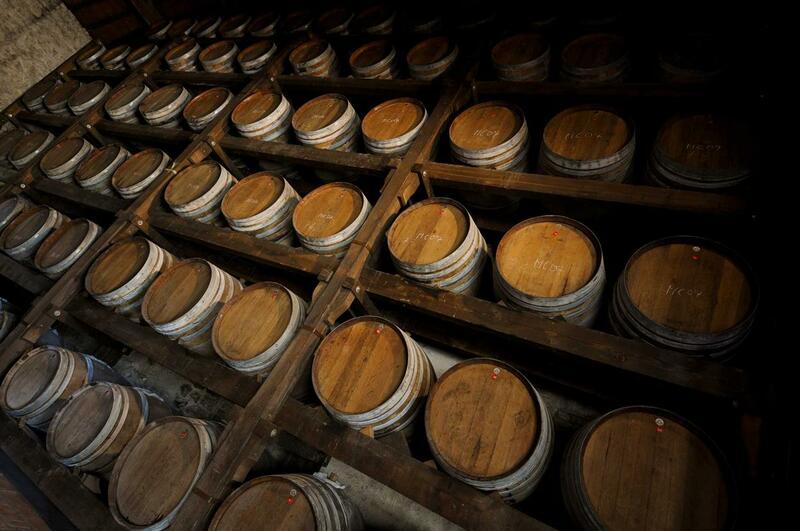 The precious liquid is decanted into wooden barrels arranged lengthways, where it remains for as long as 25 years. During this storage period art and nature come together: the barrels made out of juniper, black locust and chestnut wood give the vinegar its dark and glossy colour and its enveloping aroma, sweet and sour in equal measure. All this makes for a unique and special condiment, drop after drop. Our cellars, intentionally not air-conditioned, feel the effect of the changes of the seasons. Indeed, it is the cold of the winter and the summer heat that give Ferrarini's balsamic vinegar its unique taste. Everything happens just as it did centuries ago... During the summer, the heat lowers the level of vinegar in the barrels, so they need to be topped up. The smallest barrel, containing vinegar which has been aged for longest, is topped up with liquid extracted from the barrel that precedes it. This process is repeated until you get to the first barrel, which is topped up with freshly cooked must. How do we produce our Traditional Balsamic Vinegar? The Traditional Reggio Emilia Balsamic Vinegar PDO ages for at least twelve years in small barrels made from different species of wood in our vinegar cellars. Enjoy a taste of our Balsamic Vinegar in the comfort of your own home! One click is all you need! Do they contain any allergens? Modena Balsamic Vinegar PGI may contain sulphites. If so, this will be indicated on the label. Generally these are not sulphites added during production; their presence is due to the main ingredients that make up the product: wine vinegar and cooked or concentrated must. In the Traditional Reggio Emilia Balsamic Vinegar PDO, meanwhile, a small quantity of non-added sulphites is common. These are substances produced during the fermentation of the cooked must by naturally-occurring yeast in the grapes. The regulations for the production of the two vinegar standards, PGI (‘Protected Geographical Indication’) and PDO (‘Protected Designation of Origin’) and the strict controls their production has to undergo guarantee their authenticity. Therefore, it is highly recommended that you check the label carefully for the yellow and blue PGI or the yellow and red PDObranding to be sure that you have purchased a product where the quality is guaranteed. How can I use Traditional Reggio Emilia Balsamic Vinegar PDO? Traditional Reggio Emilia Balsamic Vinegar PDOGold is an extraordinary and complex product. It has a lingering, sweet taste and a creamy and dense consistency. These qualities make it perfect for refined dishes such as fillet of beef or goose liver or even strong cheeses (in particular Parmigiano Reggiano Parmesan) or as a dessert combined with mixed berries, strawberries and ice cream. For true connoisseurs, it is a true elixir to be sampled in a small glass at the end of a meal. Why is caramel colouring used? In Traditional Reggio Emilia Balsamic Vinegar PDO nothing can be added to the simple cooked must, so caramel colouring cannot be included in the ingredients. For the Modena Balsamic Vinegar PGI, meanwhile, the same regulations state that caramel colouring can be added in very small quantities (up to 2% of the total amount) “for colour stability”; in other words, it provides the typical brown colour in products that have been aged for less time. All producers are bound by this law and, when caramel colouring is used in production, it is always listed among the ingredients used. PDO stands for ‘Protected Designation of Origin’, which for the Traditional Reggio Emilia Balsamic Vinegar refers to a condiment made from grape must that comes from various types of vineyards found in the Reggio Emilia region. It can be distinguished by its dark, clear and glossy colour. The flavour is sweet and sour and expertly blended, and has an appreciable level of acidity and aroma. In order to assess the suitability of a product, a commission formed of five tasters drawn from a register filed at the Reggio Emilia Chamber of Commerce tastes random samples of the product and judges their characteristics. The production of this exceptional condiment is restricted to the province of Reggio Emilia in the Emilia Romagna region.